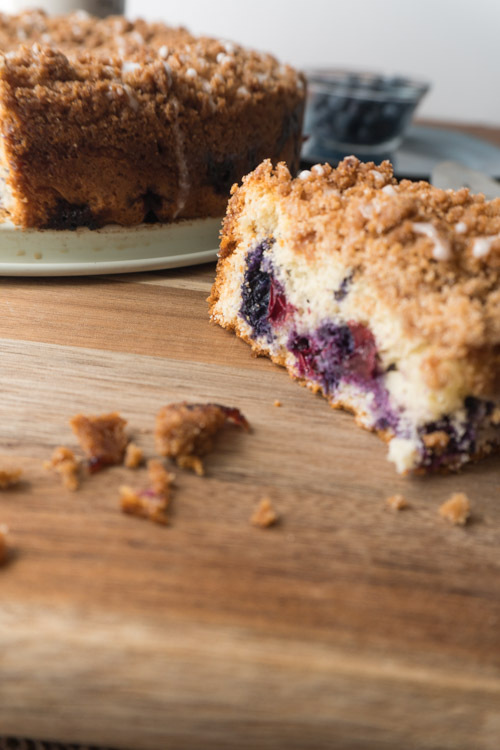 This blueberry coffee cake recipe is hands down one of the best coffee cakes ever! My husband loves it and I took it to a family get together and everyone there loved it too! And did I mention it is super easy to make? Who doesn’t love a good coffee cake? When I was little I thought coffee cake would taste like coffee- which to my young mind meant bitter! But once I was enlightened to what coffee cake really was, I was hooked! When whipping this up, I made sure to gently fold in the blueberries. That way they won’t break prior to baking and turn the whole batter grey. But hey, if that accidentally happens it will still be delicious, just maybe a slightly different color. No one will care as soon as they taste it! 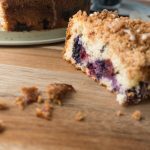 This easy blueberry coffee cake is made with bisquick- because bisquick makes everything easy and always turns out exactly how I wanted it to. So that is a winner in my book. I also made this recipe to have a lot of streusel- you know that sugary crumbly topping that everyone loves. So yeah, I made a ton of it and happily put it on top. No regrets! And if the yummy streusel wasn’t enough (which it totally is! ), I made a quick almond glaze! I used almond extract in the glaze because I love the flavor it gives, but you can use vanilla extract instead and it will still be yummy. 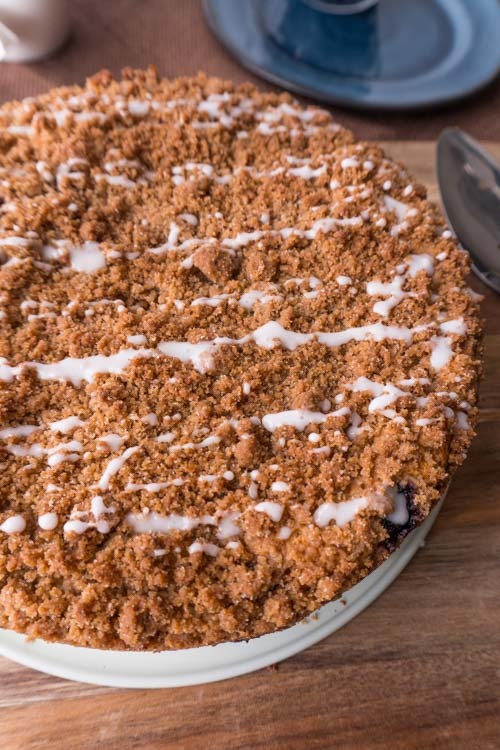 This blueberry streusel coffee cake is super light and delicious and goes great with coffee, tea or hey maybe even some ice cream! I sure hope you enjoy it as much as my family did! Let me know in the comments below! For other yummy desserts check out this caramel apple cake or these oreo cheesecake truffles! 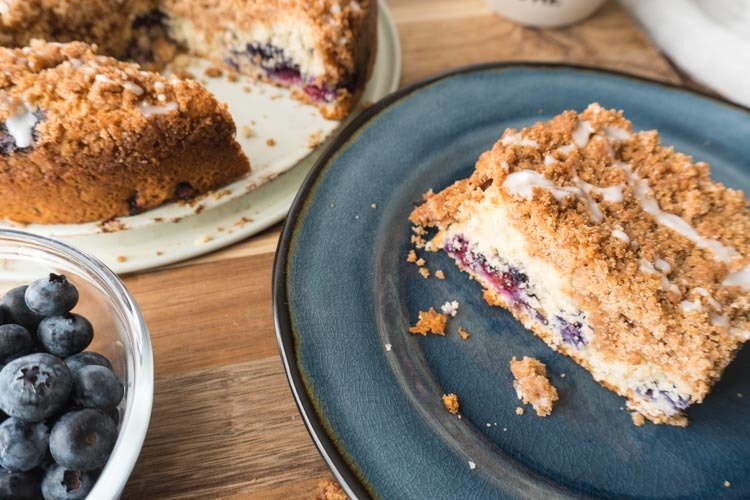 Enjoy this delicious blueberry coffee cake warm from the oven for a special treat any time of the day! Combine all the ingredients in a small bowl and mix everything together until crumbly. Set aside. Mix all coffee cake ingredients EXCEPT the blueberries, until well blended. Gently fold in the blueberries. If you mix too vigorously the blueberries will break and turn the whole cake a dark blue/grey. Spread into prepared pan and sprinkle streusel evenly over the top. Bake for 18-22 minutes or until golden brown. Combine all the ingredients until smooth. If it is too thick, add additional milk one teaspoon at a time. Notes:*Use a springform pan if you have one! That way you can take the cake out easily! 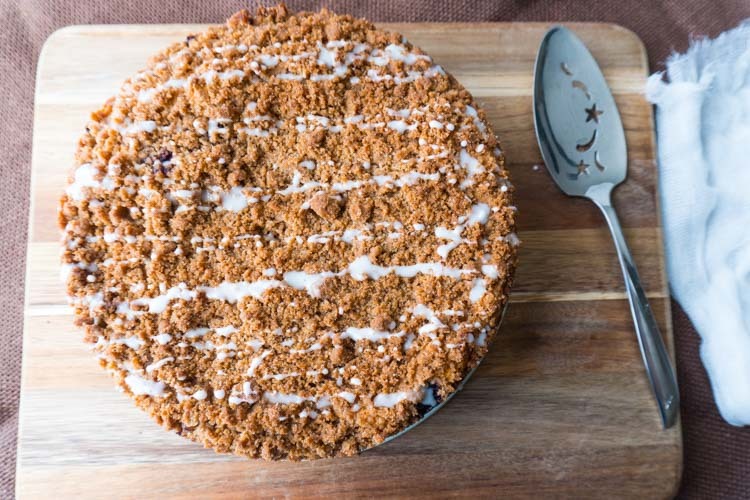 This recipe is adapted from the Betty Crocker Streusel Coffee Cake. I love coffee and Blueberry cake and this one looks and sounds out of this world! I just tried this recipe that was fab and husband liked it too. Thanks for sharing and I’m eagerly waiting for more coffee recipes. Thank you for your comment, Kathryn! We’re glad you enjoyed it.